In 1940, Varian Fry--a Harvard educated American journalist--traveled to Marseille carrying three thousand dollars and a list of imperiled artists and writers he hoped to rescue within a few weeks. Instead, he ended up staying in France for thirteen months, working under the veil of a legitimate relief organization to procure false documents, amass emergency funds, and set up an underground railroad that led over the Pyrenees, into Spain, and finally to Lisbon, where the refugees embarked for safer ports. Among his many clients were Hannah Arendt, Franz Werfel, André Breton, Max Ernst, Marcel Duchamp, and Marc Chagall. The Flight Portfolio opens at the Chagalls' ancient stone house in Gordes, France, as the novel's hero desperately tries to persuade them of the barbarism and tragedy descending on Europe. Masterfully crafted, exquisitely written, impossible to put down, this is historical fiction of the very first order, and resounding confirmation of Orringer's gifts as a novelist. Julie Orringer is the author of two award-winning books: The Invisible Bridge, a novel, and the short-story collection How to Breathe Underwater, both New York Times Notable Books. She is the winner of The Paris Review’s Plimpton Prize and the recipient of fellowships from the Guggenheim Foundation, the National Endowment for the Arts, the MacDowell Colony, the Radcliffe Institute for Advanced Study at Harvard, and the Cullman Center for Scholars and Writers at the New York Public Library. She lives in Brooklyn. "Magnificent... As in 2010's superb The Invisible Bridge, Orringer seamlessly combines compelling inventions with complex fact... Brilliantly conceived, impeccably crafted, and showcasing Orringer’s extraordinary gifts, this is destined to become a classic." "An elegant, meditative novelistic reconstruction of critical years in the life of Varian Fry... The central point of intrigue, providing a fine plot twist, is also expertly handled, evidence of an accomplished storyteller at work. Altogether satisfying. Mix Alan Furst and André Aciman, and you’ll have a feel for the territory in which this well-plotted book falls." "No book this year could possibly compare with The Flight Portfolio: ambitious, meticulous, big-hearted, gorgeous, historical, suspenseful, everything you want a novel to be." 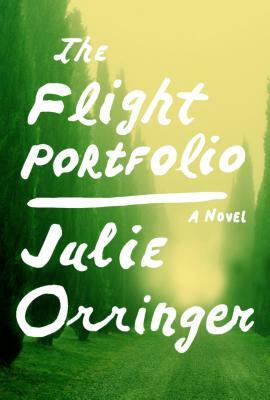 "A historical novel absolutely relevant to our own time, The Flight Portfolio brings to life a hero as complex and engrossing as the agonizing ethical questions he faces. Orringer not only recreates the world of wartime Marseille, but seems to drop the reader there by way of a masterfully fashioned literary trapdoor--and anyone who picks up this spectacular novel risks a swift descent into its vivid and consuming swirl."